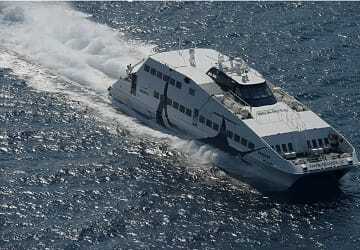 The Mykonos Thira ferry route connects Cyclades Islands with Cyclades Islands and is currently operated by 3 ferry companies. 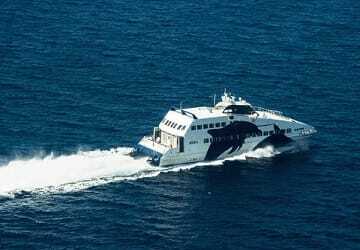 Minoan Lines operate their crossing up to 6 times per week, Sea Jets 4 times per day & the Golden Star Ferries service is available up to 3 times per day. 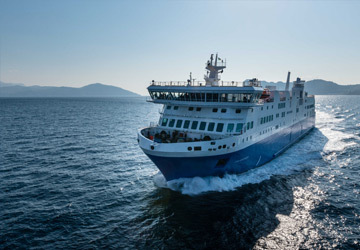 There are a combined 55 sailings available per week on the Mykonos Thira crossing between Cyclades Islands and Cyclades Islands and with 3 ferry companies on offer it is advisable to compare all to make sure you get the best fare at the time that you want to travel. Prices shown represent the average one way price paid by our customers. The most common booking on the Mykonos Thira route is a car and 2 passengers. 2hours trip from Mykonos old port to Santorini have been very pleasant. "Smooth sailing Mykonos to Santorini "
We travelled with Seajets from Mykonos to Santorini on the 09:50 sailing. We arrived with plenty of time as stated on the ticket however the ship was nearly one hour late getting to Mykonos and so we arrived in Santorini nearly one hour late. This meant that we missed our booked Catarmaran Sunset Cruise which we only had one day to take. The staff are very efficient and have a quick turn around and once onboard it was a lovely journey with plenty of space and comfortable seats. 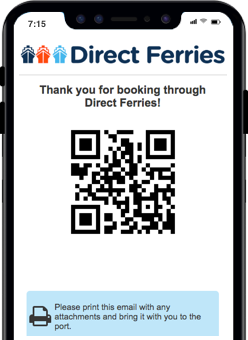 I understand there there may be delays so do not book anything either side of the sailing as it is likely not to run on time. 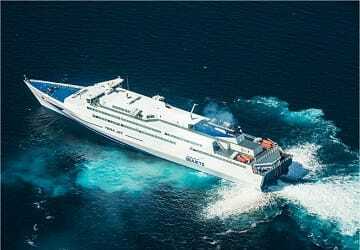 However, compared with other ferries we have taken in Greece I found this to be the most friendly, efficient and smooth journey of them all and would definitely choose Seajets over other ferries again. "comfortable journey. 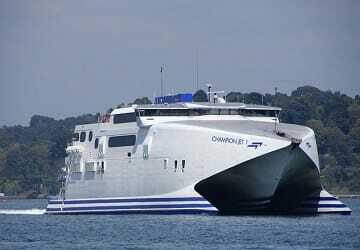 would take this ferry again. " Very comfortable seats. Clean bathrooms, quick journey. Comfortable anf fast trip. Better than the competition on the same route. The ferry was a little late. It was uncomfortable to carry our luggage to the business class cabin. The space to place the luggage in the ground floor was completely full so we had to climb up a flight of stairs. Other than these two issues it was a comfortable and fast ride. 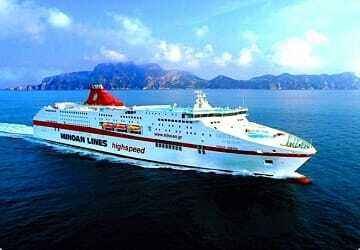 Fast and clean ship... Not too busy, only the delay made the difference..
"Great trip, easy to book"